This healthful cooking ingredient enhances the flavor of many everyday dishes, and is waiting to be your new best friend in the kitchen. The basic recipe combines carrots, celery, garlic, onions, salt and sometimes a splash of white wine vinegar. You can make your own soffritto and store it in the fridge (we’ve included the recipe in the full review). 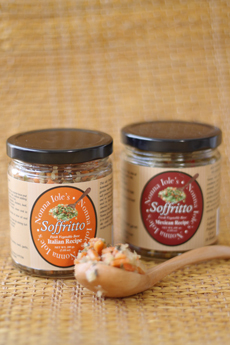 Or you can buy a jar of Nonna Iole’s Soffritto. It’s a quick, easy and delicious solution to amping up your food. It’s also a nice party favor, stocking stuffer and small ”thank you” gift. In fact, you can buy boxed gift sets as well as individual jars on the company website. You’ll also find a store locator. Soffritto: Your new friend in the kitchen. Photo by Elvira Kalviste | THE NIBBLE.